With the help of virtual desktops using VMware Horizon, applications such as ImageNow are now available to any employee, from any location, on a variety of devices. This does not require a VPN connection. Open a browser and go to the website http://desktops.umes.edu. Select the option for 'VMware Horizon HTML Access'. Login with your UMES username and password, and make sure the domain is 'UMES'. Click vDesktop from the selection of your entitled desktops. This will launch a window with a UMES Windows desktop system and log you in. This virtual desktop grants access as though you are on a physical campus computer. This includes network drives (Q: and H: drives), Microsoft Office, etc. Double-click the ImageNow icon on the Desktop and login as you normally would. When you are finished, simply log out or close your browser window. The user must have the VMware Horizon client installed on the device they are accessing FROM in this scenario. The client can be downloaded for free at https://www.vmware.com/go/viewclients. During the installation of the Horizon client, the server name will be 'desktops.umes.edu'. 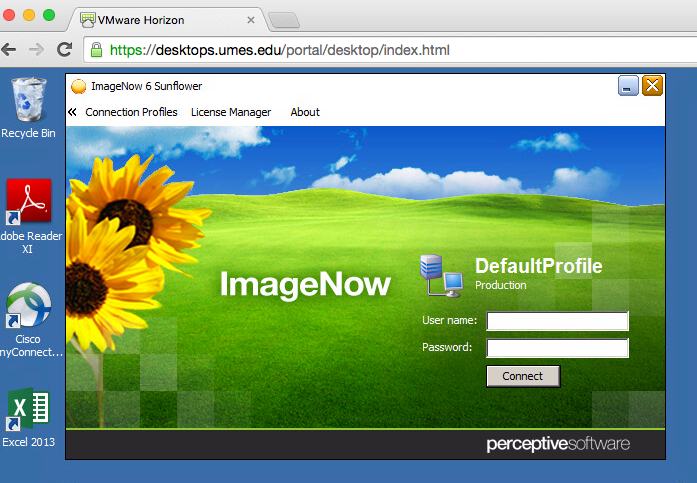 Launch the VMware Horizon client and select the 'desktops.umes.edu' item. Double-click 'ImageNow' from your selection of virtual desktops and applications. The ImageNow client should open seamlessly on your device. Login as you normally would.